A deep brain stimulation system (DBS) delivers electrical impulses to specific brain areas to restore the balance of circuits that are disrupted, overcoming abnormal activity in that region. DBS may be a surgical option for patients who have neurological disorders that are not adequately controlled by medical therapy. A patient who receives DBS will have three components surgically implanted. During brain surgery, thin electrical leads are placed deep in the brain through small holes drilled through the skull. These leads will deliver low-voltage electrical current to a particular brain region to modify neural activity. A small battery – similar to a heart pacemaker – is implanted under the collarbone. An extension wire is passed under the skin, along the neck and behind the ear, to connect the battery to the leads. Specific stimulation parameters are set for each patient. At home, patients may use a handheld remote control to turn stimulation on and off or switch between different settings. By 2018, it was estimated that more than 150,000 deep brain stimulation implants had been performed around the world. The procedure is among the class of therapies known as neuromodulation, which one day may become more routine for managing chronic disease, the way hip implants or glucose monitoring are today. To date, DBS has been used to treat symptoms of neurologic disorders such as Parkinson’s disease, tremor, dystonia and epilepsy. It is currently being investigated for a number of other conditions such as psychiatric diseases. DBS received FDA approval in 1997 to treat motor symptoms of movement disorders, since it helps to reduce the uncontrollable shaking of tremor in essential tremor or Parkinson’s disease, or the involuntary twisting of dystonia. DBS was developed after a patient’s uncontrolled tremor was seen to decrease during brain surgery when electrical stimulation was used as a test. Earlier treatments, called thalamotomy and pallidotomy, controlled motor symptoms by surgically destroying discrete parts of the brain. Once it became possible to deliver electrical stimulation continuously through an implanted device, DBS became the preferred treatment. DBS does not permanently destroy brain tissue, is adjustable, and has been shown to be at least equally effective. Up to 28 percent of Parkinson’s patients whose symptoms are not adequately controlled by medication alone may be good candidates for DBS. Although it is not a cure, DBS can prolong the benefits of medication, allowing patients to reduce medication doses and limit side effects. The goal of therapy for Parkinson’s disease is to improve motor symptoms, so patients can better perform activities of daily living and enjoy enhanced quality of life. Generally, movement symptoms that diminish with lepodova medication will also improve with DBS. In Parkinson’s patients who feel “frozen” after medication wears off, DBS can reduce the length and severity of those periods. In some patients, stimulation also reduces the involuntary movements of dyskinesia caused by long-term use of the medication lepodova. A beneficial effect on tremor is often seen early on during DBS treatment, with those symptoms becoming much reduced for many patients. 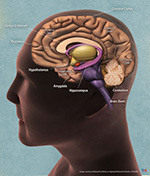 Several structures deep within the brain have been shown to work well as targets for stimulation. These include the subthalamic nucleus (STN), the globus pallidus internus (GPI) and ventral intermediate nucleus of the thalamus (VIM). Each of these locations serves as a critical station along the complex circuitry necessary for control of movement. The stimulation target selected is based on the symptoms to be treated. Stimulation of the subthalamic nucleus and the globus pallidus can provide control of a wider range of symptoms (in addition to tremor) and are currently used more often in Parkinson’s disease than stimulation of the thalamus. Newer targets are also being investigated to capture symptoms that are still inadequately controlled. By stimulating different targets for various disorders, DBS can also be used to control symptoms in medically refractory epilepsy, chronic pain such as central pain syndrome, obsessive compulsive disorder (OCD), Tourette’s syndrome, and major depressive disorder. DBS received approval from the FDA in 2009, under its humanitarian device exemption, for treatment-resistant OCD. DBS has also been researched as a potential therapy for anorexia, obesity, cocaine addiction, memory disorders, and aggression. These additional investigational applications of DBS utilize stimulation at various locations or targets within the brain. For severe depression that has not responded to medication, one DBS target is a brain region identified as Brodmann area 25. For OCD, stimulation targets include a junction of the ventral capsule/ventral striatum, at the anterior limb of the internal capsule, known as the VC/VS. For epilepsy, deep brain stimulation targets include the anterior nucleus of the thalamus and the hippocampus. In investigations of treatment for Alzheimer’s disease, research has targeted the fornix, a key area in forming memories. Please note:This information should not be used as a substitute for medical treatment and advice. Always consult a medical professional about any health-related questions or concerns.